tataray (Charentes-Poitou, France) on 9 July 2018 in Sport & Recreation. A St Loup sur Thouet 79. En plein air et chez l'habitant . Une très belle initiative qui colore la commune. Ce festival devait vraiment être fascinant, et voir les artistes travailler, quel chance ! This scené is nicely captured. Very nice capture here !!!!!!!!!!!!!!!!!!!!!!! Great capture of these artists in action with their creations!! That popsicle looks refreshing. How fun to see the artists creating!!! 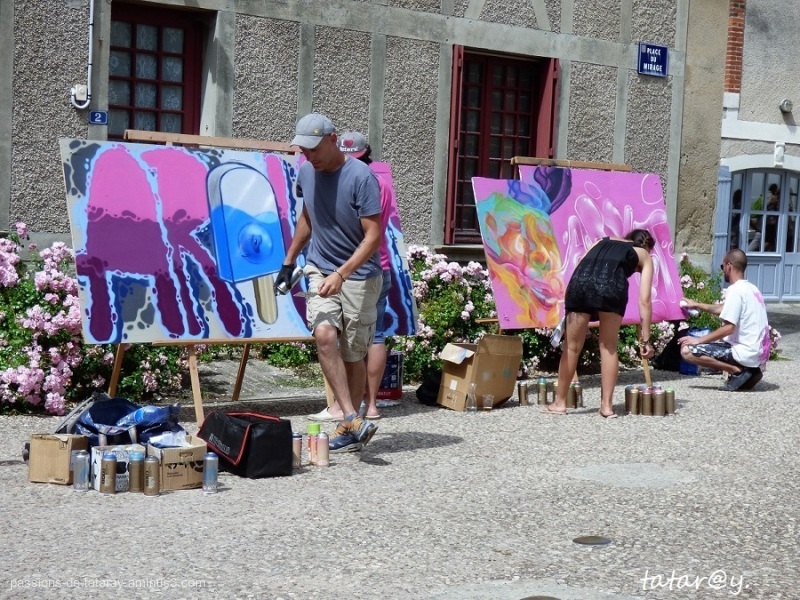 Et même un concourt de "Graff"
An interesting street scene of these artists at work. A very good action shot. Quelles couleurs ...ça réveille le village ! Belle composition. A cool shot of the artists in action. what fun - to make art on the street in front of festival goers! Fabulous outdoor scene, lovely work.